This month, we mark the 50th anniversary of one of the most dramatic — and traumatic — turning points in American history: November 22, 1963, the 35th President of the United States was assassinated while riding with his wife in the back seat of an open, midnight blue convertible limo. Half a century later, events of that Friday morning still replay in the minds of Americans as they did then — where they were; what they were doing — will forever be etched in their memories. 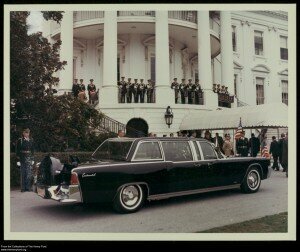 An integral part of that tragic event was the open limo the President was riding in. Iconic photos of the First Lady crawling over the trunk, assisted by a Secret Service agent are familiar images to most Americans. History of what happened is well documented: a new President was sworn in onboard Air Force One, the accused shooter was shot on live television by a night club owner, the funeral with a young boy saluting the coffin, a nation in mourning. But where did that new Lincoln go? 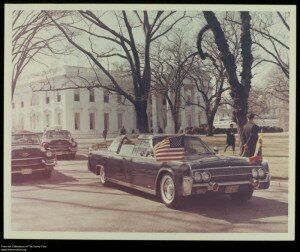 The President’s car, built in Wixom, Michigan, when completed in 1961, was a four-door Lincoln Continental convertible. It was modified at Hess & Eisenhardt of Cincinnati, Ohio where it was cut in half and had a three-foot extension added. Along with the extra length, it had a special rear seat installed with special padding and leather. This rear seat had a hydraulic lift that could raise the seat ten and a half inches so the rider(s) could have an elevated yet comfortable view. Besides a special seat, the car had a PA system installed, two radio phones, special lights inside, flashing red lights outside, sirens, and additional exterior hand holds on the trunk and footholds for security personnel. The Secret Service code-named it the “X-100”. It had three different rooftops — one being made of clear plexiglass — and this roof was almost used that day, as it had rained the day before. However, none of the roofs were bulletproof. During 1963, the wheel covers (hub caps) were replaced with the “sombrero” style covers of the 1957 Lincoln Premiere. Also, the grill was replaced with a 1962 model grill. Right after the events had transpired in Dallas, the limo was loaded onto a cargo plane and flown into Andrews Air Force Base. From there it was taken to the White House garage and thoroughly inspected, documented and analyzed. This inspection continued for months by the FBI, Secret Service, and members assigned to the Warren Commission. When the investigation was concluded, the car was sent to Cincinnati for an overhaul by the company which first made the limo. During the overhaul, a larger engine was installed, to give the car added power to accommodate the additional features being built into the car. One major replacement was the installation of a permanent, bulletproof roof. Additional titanium armor plating was added to the rear section of the car, as well as to the trunk area. The floor was also replaced with heavy steel to withstand grenades. Run-flat tires were installed and all the glass was replaced with extremely thick, and bulletproof, glass. Not all modifications were just for safety — a second air conditioner was installed in the trunk to keep the backseat passengers comfortable. These additions nearly doubled the weight of the car. During the Johnson presidency, he insisted that he be able to roll down his window in the back, so back to the shop the car went again, for a window that could be raised and lowered. He also demanded that the car be repainted black.